Our guide to egg hunts, breakfast with bunny, fairs and festivals, farm tours, crafts, recipes and more! Infant swim classes in Marin County start as early as six months old, and are usually parent/child sessions. Find a class here! All Aboard for Railroad Adventure! Check out our guide to train rides and railroad adventures for families in Northern California. Here is a list of of year-round and opening dates for a variety of local farmer's markets throughtout Marin and the North Bay. 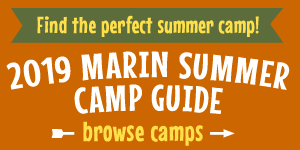 Make your reservations now for a great first-time camping experience with the kiddos in Marin and beyond. Here are our picks for Easter and Earth Day events and other fun activities for children and families this weekend in Marin and the Bay Area. The public is invited to sell at this enormous consignment style sale, sponsored by the Marin Parents of Multiples Club (MPOMC) on Saturday, June 1 at Marin Catholic High School in Kentfield. Take the kiddos on a real train ride! Find your favorite in our guide to family-friendly train rides and railroad adventures in the Bay Area and Northern California. If you haven't been out to the beautiful and picturesque Slide Ranch in Muir Beach, now is your chance! Their biggest farm event of the year, Spring Fling, takes place Saturday, April 27. Marin Mommies is the go-to guide for parents and families in Marin County and the San Francisco Bay Area, with events and activities, local schools, neighborhoods, summer camps, travel ideas, and more.